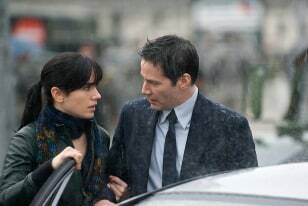 In "The Day the Earth Stood Still," a remake of the 1951 science-fiction classic, an alien named Klaatu (played by Keanu Reeves, right) visits Earth to save us humans from ourselves. The story is a work of science fiction, with the emphasis on fiction, says Seth Shostak, a senior astronomer at the SETI Institute and a technical adviser on the film. For example, to be able to detect a dangerous buildup of carbon dioxide in our atmosphere and come save us from global warming, an alien that could travel at light speed would have to reside no more than about 50 light-years away. "I doubt that there are any aliens that close," Shostak says. And even if there are, "they might not care about our problems." Scientific accuracy aside, Shostak says the film could hook a new generation on space science, just as the original film helped direct his career, which is dedicated to the search for E.T. As kids stumble out of the theater, they might ask, do aliens exist? Click the "Next" arrow above to explore the evidence, from the scientifically plausible to the incredible. Shostak notes that there is no direct proof for any life beyond Earth, but the universe is home to a lot of stars. And as research over the past decade has shown, perhaps at least 50 percent of those stars harbor planets. Shostak estimates there are 1 trillion planets in the Milky Way alone. "Surely some of them have undergone what Earth has undergone and developed life, and eventually what we call sentient life," he says. The argument, he notes, is simply one of probability. "If we are the only intelligent beings in the galaxy, or for that matter in the universe, then we are truly a miracle," he says. 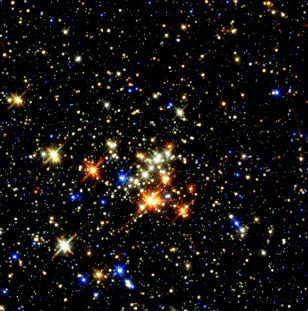 This image from the Hubble Space Telescope shows a cluster of young stars in the Milky Way. Water is a key ingredient for life as we know it. And liquid water, it turns out, is fairly common in our local solar system. For example, evidence is mounting that liquid water may flow underneath the surface of Mars. Europa, a moon of Jupiter, appears to have a liquid ocean. So too might the Jovian moons Callisto and Ganymede. 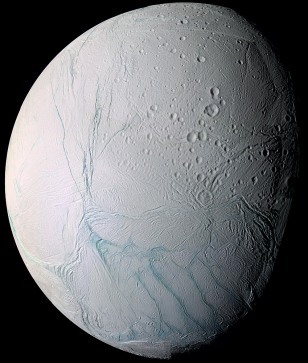 Saturn's moons Titan and Enceladus, shown here, may be watery. Even Venus might have a bit of liquid water in its atmosphere. "There you already have seven other worlds that might have liquid water, just in our backyard. So that's kind of encouraging news," Shostak says. Scientists estimate that planet Earth is about 4.5 billion years old. 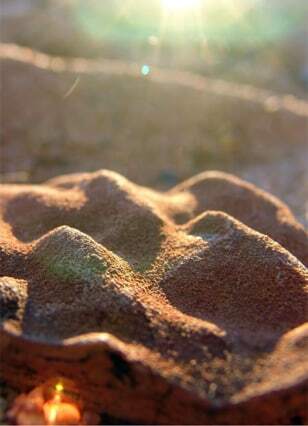 The earliest evidence for life comes from 3.4 billion-year-old mats of bacteria called stromatolites in Australia. Since even bacteria are biologically complex, scientists think they arose from life forms that got a foothold on Earth even earlier. "That suggests it wasn't terribly improbable, the evolution of life, because it happened very quickly," Shostak says. The caveat, of course, is that Earth could have won the evolutionary equivalent of the lottery, and no place else is quite so lucky. Almost everywhere scientists go on Earth, they find life: the cold, dark depths of the oceans; snuggled up to piping-hot hydrothermal vents; buried under the Antarctic ice; and in South America's parched Atacama Desert. "Life can adapt to really tough conditions and, of course, most of the universe is going to be filled with habitats that are tough," Shostak says. 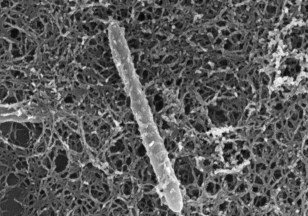 For example, Mars is a harsh environment, but some of the microbes found on Earth, including the one shown here found deep in a mine, could survive beneath the surface of the Red Planet, he notes. These findings of so-called extremophiles have allowed scientists to scale back their list of requirements for extraterrestrial life. "We just say it has to have some liquid water, and maybe that's it," Shostak says. Shostak and his colleagues at the SETI Institute frequently harness some of the world's largest radio telescopes to home in on distant stars for a telltale signal of alien communications. Although their searches have raised a few alarms, the signals have been dismissed as human-caused interference, such as noise from a passing satellite. Contact remains elusive. Undaunted, the scientists keep searching. Meanwhile, a signal detected on Aug. 15, 1977, during a search with Ohio State University's Big Ear Observatory, continues to pique interest because it has never been explained. "It was impressive enough to encourage the astronomer who found it to write 'Wow!' on the printout," says Shostak. Follow-up experiments to detect it again, however, have failed. "You can say it was E.T. and then he went off the air. You may never know," Shostak says. "But it is not science to say it was E.T." Somewhere around half the people in the U.S. believe that aliens have already visited us. To back their claims, witnesses have presented snapshots of flying saucers and debris from crash landings. None of the evidence, however, convinces Shostak. Nor does he buy into theories that the world's governments are coordinated and efficient enough to collectively keep what would be the world's biggest secret. "That's hard for me to believe," he says. Such doubt does little to stop the tide of tourists coming to places such as Roswell, N.M., the site of a purported UFO crash more than 60 years ago. 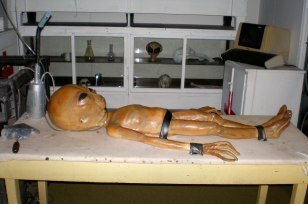 This fake alien at a museum is a commonly photographed attraction.